Shenzhen police used pepper spray on a group of protesting pneumoconiosis workers on Wednesday night. “We want to eat! We want medical care! We want dialogue with the Shenzhen mayor!” workers chanted in front of a government building. 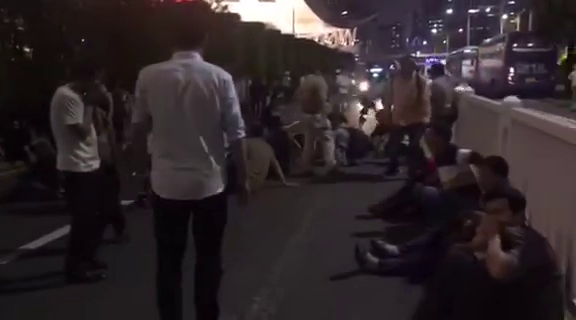 Shenzhen police used pepper spray on a group of protesting pneumoconiosis workers on Wednesday night. In a video circulating in Chinese social media, some of the workers, already debilitated by the fatal occupational illness, were seen falling to the ground as they could not breathe. In a separate video, a worker’s hand is seen bleeding as a colleague off camera condemned the use of force against them. Workers with the occupational illness pnemoconiosis, also known as black lung disease, gasp for air as Shenzhen police use pepper spray on them. Around 200 pneumoconiosis workers and family members from Leiyang, Sangzhi and Milu in Hunan province arrived in Shenzhen on 5 November and gathered at Human Resource Park, the local offices of the Ministry of Human Resources and Social Security (MOHRSS). “We want to eat! We want medical care! We want dialogue with the Shenzhen mayor!” workers chanted in front of the government building. The workers, who contracted the occupational illness in the 1990’s while working in construction sites, demand their long overdue compensation. They argue they have not been properly diagnosed with the occupational disease, that the compensation they’ve been offered is insufficient to cover for medical bills and that the Shenzhen government did not fulfill its promise to reimburse them 2,000 yuan in transportation fees. On Thursday noon representatives from the Shenzhen MOHRSS, the labour arbitration bureau and the municipal Party secretary agreed to meet worker representatives. Workers presented a detailed three-stage occupational disease severity scale with corresponding compensation, with an emphasis on paying the worker as soon as pneumoconiosis is diagnosed, without needing to establish prior employment relationship. As it is far too common in China’s construction sector to leave workers with no labour contracts, workers know it is very difficult for them to prove they were employed in Shenzhen. Workers were not satisfied by the government representatives’ response to their demands. The officials insisted it was essential to establish labour relations before paying workers compensation as stipulated by insurance regulations, otherwise workers are only entitled to receive relief handouts. No agreement was reached and the workers vowed to continue their protest. The ongoing collective action is only the latest trip to Shenzhen pneumoconiosis workers from Hunan have made since 2009. Earlier in 2018 they had already made at least one trip to the southern city to present their demands. “Winter came and went and came back again, and here we are still waiting for what we’re owed,” lamented a worker from Sangzhi. Workers claim they had no choice but to camp inside the government building because hotels nearby had been instructed not to take their bookings and their ID cards seemed to be in some sort of blacklist. In fact, after repeated trips to Shenzhen, many of the workers have little or no money to spare, most have been incapacitated and unfit for work for many years and spent most of their savings covering medical bills; some of them borrowed money for transportation fees and food. Pneumoconiosis is by far the most prevalent occupational disease in China, but due to the complicated bureaucratic procedures involved and the overbearing influence of employers on the adjudication process it is notoriously difficult for workers to get an official diagnosis and confirmation of occupational disease.